Toyota Motor Corporation is aiming to make up 20 per cent of its total vehicle sales in India with hybrid cars by 2020. In line with its ambition, the Japanese carmaker has launched the new Camry Hybrid (Rs 31.98 lakh) and the fourth-generation Prius (Rs 38.96 lakh) in India today. Both the prices are ex-showroom, Delhi. The new Camry Hybrid is powered by the 2.5-litre engine coupled with an electric motor that produces a combined output of 205PS. The Camry Hybrid also comes with electronically controlled variable transmission which helps it offer a higher efficiency of 19.16kmpl, claims Toyota. The 2017 Camry Hybrid gets some cosmetic updates too. The most important updates are new LED fog lamps, 15-spoke alloy wheels, LED headlamps with DRLs, and auto-folding and reverse linked ORVMs with memory. Inside, the new Camry Hybrid gets a 12-speaker JBL audio system, high-density dash silencer and acoustic windshield glass, and collapsible headrest for front passenger seat. Its safety features include nine SRS airbags along with a knee bag, new tyre pressure monitoring system, vehicle stability control with traction control, rear seats with ISOFIX mounts and hill-start assist control. 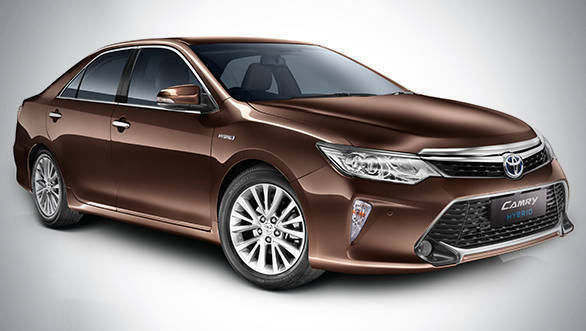 The new Camry Hybrid is available in six colour options and qualifies to receive a Rs 70,000 discount under the FAME scheme. The new Prius, globally launched last year, is available only in Z8 variant in India. 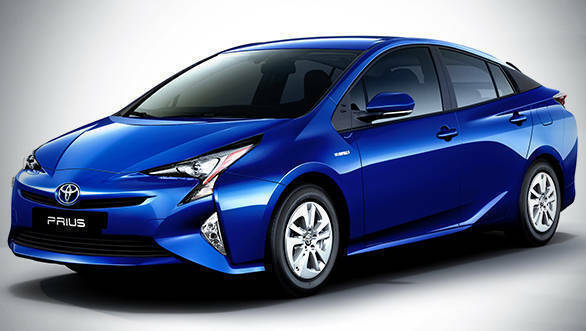 The new-generation Prius is the first car to be developed on Toyota New Generation Architecture (TNGA). We have already described how TNGA's low-stance designs give Toyota cars a lower centre of gravity, which in turn, provides a better driving experience. Under the hood, the fourth-generation Prius gets the 1.8-litre petrol engine which generates 98PS of power at 5,200rpm and 142Nm of torque. Powered by the Hybrid Synergy Drive system, the new Prius delivers a claimed efficiency of 26.27kmpl. The updated hybrid gets a slew of interior as well exterior changes. Its exterior updates include LED headlamps, LED fog lamps with DRLs, 15-inch alloy wheels and smart entry with push-start system. Inside, the new hybrid gets a 10-speaker JBL audio system with DVD, AM/FM, CD, MP3, USB, Aux-in and Bluetooth compatibility. Its cabin also features new leather seats, eco-driving indicators, head-up display, seat heater, wireless charger and dual auto AC. With respect to safety, the new Prius features seven airbags, seat belt warning, immobiliser and rear seat with ISOFIX mounts. Toyota has also announced that it sold over 10.05 million hybrid cars globally as of January 31, 2017. The Japanese carmaker claims that its hybrids have helped save more than 77 million tonnes of CO2 emissions over the years.